The demographic cycle is one of the most important, yet often neglected, factors for predicting economic prosperity and performance. Demographics, statistical data related to the population and its various sectors, often reflect social changes that drive the economy. 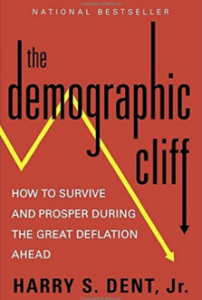 I discussed the connection between demographics and economics with economist Harry Dent, author of The Demographic Cliff: How to Survive and Prosper During the Great Deflation Ahead. He told me that in light of the extreme changes and advances in technology and standards of living in the past half-century, demographics are even more important to economic forecasting than ever before. According to Mr. Dent, demographics, “is the most important factor and it has even told us when inflation is going to rise and fall decades in advance.” For example, in the late 1980s, Mr. Dent predicted that the baby boom in the United States would keep driving up its economy until 2007. Economies often work in cycles. Currently western countries such as Europe, the United States, and Japan have an aging population; the “baby boomers” who were born when birth rates rose in these areas after World War II are now growing older. In countries with higher birth rates, such as India or Israel, the economy is different since there are a higher proportion of young working people. But what will happen in the future when this population starts to age, too? Other cycles also affect the economy. Economists have recognized that apart from the demographic cycle, there is an innovation cycle of 45 years, a geopolitical cycle every 36 years, and a boom-bust cycle of around 10 years. What defines these cycles, and how do they affect the economy? What does Harry Dent believe is going to happen next to the world economy? For the answers to these questions, watch the video of our interview here.